Some of you may recognize a similar image from a "Title This..." post last summer, but I just couldn't resist sharing this shot too. 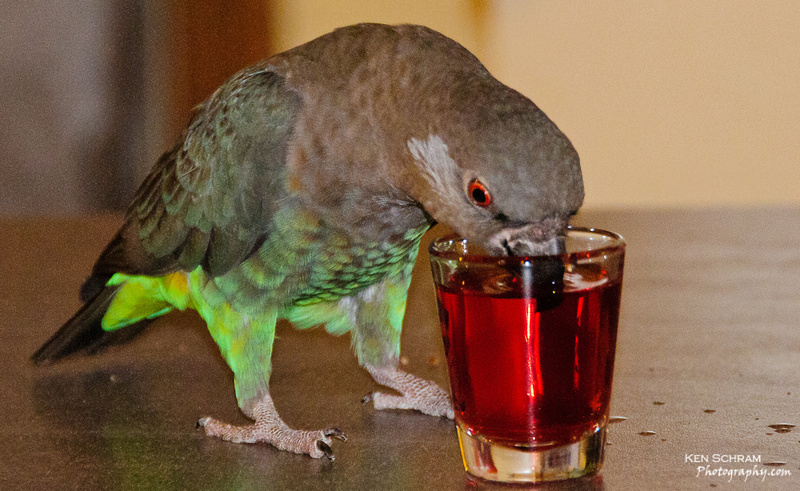 Nothing beats a shot of cranberry juice after a hard day of working knots out of strings, foraging in your cage for food to throw onto the floor, screaming at your brother in the cage next door, and then spending your evening flying around the house like the crazy bird that you are. I've titled this masterpiece "The Night Cap". Use the comments section below to offer up your own funny title. Hee, hee... sorry... this just never gets old for me :-). Who knew you could find such personalities in these little feathered packages?